Photo Credit: Neal Preston / Warner Bros.
Great movies, like great novels, often compel us to entertain life’s bigger philosophical questions. They can help us think, feel and move through our own lives with greater awareness and depth. 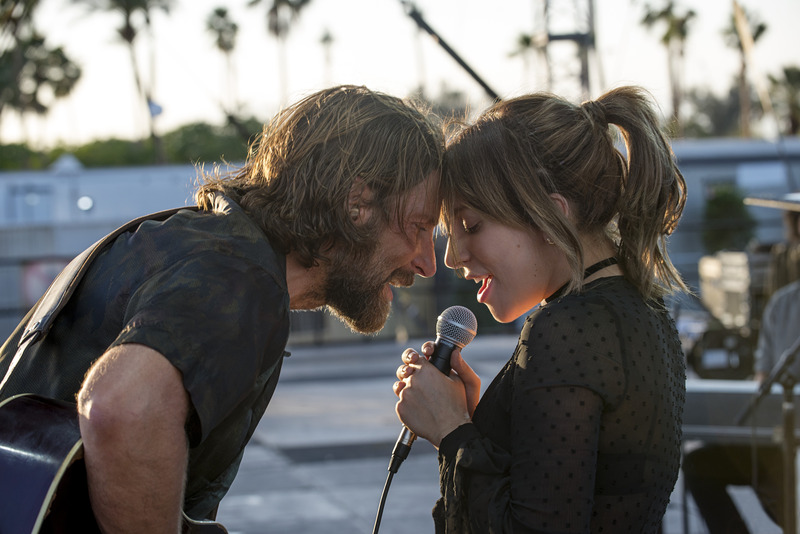 Bradley Cooper’s cinematically grand reimagining of the classic A Star Is Born (remade for a fourth time with this latest effort), does just that. A singer-songwriter, Ally (played to perfection by the incomparable Lady Gaga), confines her immense talent to a small drag bar, stifling her big stage dreams, when Jack Maine (Cooper), a rugged country-rock star, spots her crooning Édith Piaf’s “La Vie En Rose.” Mesmerized by her, he extends her his massive platform, as well as his faith in her abilities, enabling her career to soar. Cooper, who co-wrote, produced, directed, acted and sang — phew! — offers sensitive meditations on many subjects throughout the 135-minute movie, including the nature of addiction, childhood trauma, destructive beauty standards, the loneliness of celebrity, and authentic versus commercial art. It may sound over-stuffed, but he pulls it off masterfully. During their first encounter, Ally is backstage among her drag sisters, who are in various states of aestheticization, removing her wig and make-up. In a funny scene loaded with symbolism and foreshadowing, Jack peels off her ridiculous fake eyebrows, as if to say: I want to see who you really are. He says he’ll wait for her — as long as it takes — as she undergoes the very time-consuming process of removing her multiple layers of cosmetics to see her unmasked face. Later, as they share drinks at the bar, she runs her index finger down the spine of her nose, telling him that music industry insiders had told her that her nose was too big, and she wasn’t pretty enough to “make it” — that people wanted to hear her, but not look at her. Jack, a sensitive soul, looking for something real to counterbalance the artifice and emptiness of celebrity, replies: “I think you’re beautiful.” The gesture of her swiping the outline of her schnoz becomes a poetically charged metaphor throughout the film for challenging a dominant and destructive paradigm of beauty that limits and undermines women’s potential. Her nose, and all the parts of her that are raw, including her talent, are why he falls in love with her. “There is nothing more rare, nor more beautiful, than a woman being unapologetically herself, comfortable in her perfect imperfection,” motivational speaker Steve Maraboli writes in Unapologetically You: Reflections on Life and Human Experience. That sums up Jack’s view, but when Ally’s star begins to rise, she gets pulled into an entirely new direction by a major music executive — orange hair, mounds of make-up and hyper-sexualized lyrics and dance moves — that prompt Jack to say, cruel and cutting, during one brutal fight: “You’re ugly.” While it’s hard as a feminist to hear those words hurled at a woman by a man — and to watch two men in a tug of war to define her — Jack’s overriding point (even if unfair and misguided) is that she’s not being true to herself — and that to not be yourself is to be ugly.